Retired General Practitioner Born: October 7, 1928 Died: October 3, 2012: The name of Dr. Elizabeth Haggarty will always be associated with Maybole and the surrounding villages of South Ayrshire. For this was a unique lady: a highly-respected General Practitioner, but also a faithful friend to all who knew her, who now holds a lasting place in our history and in our hearts. Born on 7th October 1928 in the Springburn district of Glasgow, the youngest daughter of Henry and Agnes Haggarty, Betty (as she was to her intimates) graduated in medicine from the University of Glasgow in 1951. Thereafter, she underwent further training in the Scottish Borders, working from the cottage hospital in Galashiels. In September 1953 the young Dr. Haggarty came to Maybole to join the single-handed practice of the late Dr. William B. McLean, with whom she worked from 1953 until 1976. Through Dr. McLean's high skill in general practice (especially in domiciliary midwifery) Betty learned much from her mentor, and, as she herself recalled, 'how to enjoy the work and enjoy the patients'. After thirty-seven years of 'sharing the district's joys and sorrows', Betty retired on 1 October 1990, when her colleagues moved into Maybole Health Centre, though she continued to live in the town, until she became resident at Malin Court Care Home, near Turnberry, in May this year. 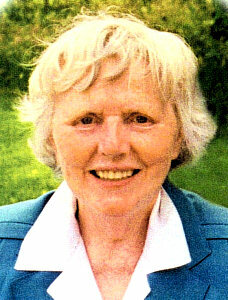 As we think of Betty, we recall a caring, conscientious GP for whom the call of duty was a blessing, not a burden. Throughout her years in practice, she regarded her patients and their families as friends, and was ready to respond to any need during the day or night, even if it meant leaving a function early, or making late-night calls, or, as on one occasion, walking through a mud-ridden field to the scene of a road accident. Her surgeries were legendary for the length of time spent with each patient - something not always appreciated by those in her packed waiting-room! Nevertheless, Betty was firmly of the mind that her surgery should have more the atmosphere of 'a club of friends', which she always actively encouraged. Betty Haggarty's life went beyond the boundaries of medicine. She loved classical music, and was an active patron of the arts and of matters cultural. For many years, she was a supportive committee member of the Ayrshire Archaeological and Natural History Society, giving generously of her energy and enthusiasm. She was widely-travelled, with a particular affection for Germany, her mother's home country. She was also interested in family history and had acquired a considerable knowledge of Ayrshire's titled and landed families, as well as the family history of her patients. Above all, she loved Maybole - the capital of Carrick - which she once described as 'unique'. Betty was a great collector: she filled her home with 'all kinds of everything', giving much of it away to those she thought would benefit from it. She was also a compelling conversationalist: a close friend once said (kindly) - 'Betty could talk without drawing breath!' No function, high or humble, was the poorer of Betty's input, and she proved to be the life and soul of many a gathering. To Kirkmichael Church, Betty was particularly supportive. She worshipped there for nearly sixty years, consistent in her habit of arriving late, about which she repeatedly made humorous confession! To other charities and people in need, she was open-hearted and open-handed, and many have good cause to be grateful to her generosity. In later years, Betty, always family-orientated, cared for her sisters with unceasing devotion, making Maybole a home for Nancy, Catherine (Kathleen), Henrietta (Etta) and Margaret, and sharing their last years with them. In the Old Testament, the Book of Proverbs reminds us that a good reputation is much more important than worldly wealth. In the life of Betty Haggarty, we see how true this is. For here was a lady of immense personal integrity - though unassuming, and often private - a pleasure to work and worship with, and one whose reputation as a family doctor in the traditional mould will always be highly upheld. Following a well-attended service at Kirkmichael Church, near Maybole, Betty was laid to rest beside family members in Cadder Cemetery, Bishopbriggs. It was, however, among the people of South Ayrshire that she carved her niche in the edifice of time, and where she will always be remembered with great affection and appreciation.